Ubiquiti Point to Point link using the lastest ac airMAX technology, the PBE-5AC-500-ISO supports up to 450+ Mbps real TCP/IP throughput. It launches with PtP functionality, and a client mode feature will be added with a future firmware upgrade. 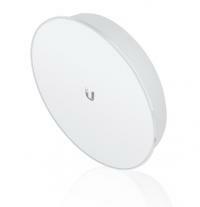 The Ubiquiti PBE-5AC-500-ISO also includes a protective radome to shield the radio from the elements. 2 units are required for a link.